Opinion Poll: Where Have The Buyers Gone In Tallahassee? While doing the research necessary for our monthly supply and demand report, I found a continuing trend that we first began reporting in February. This is not a good trend. 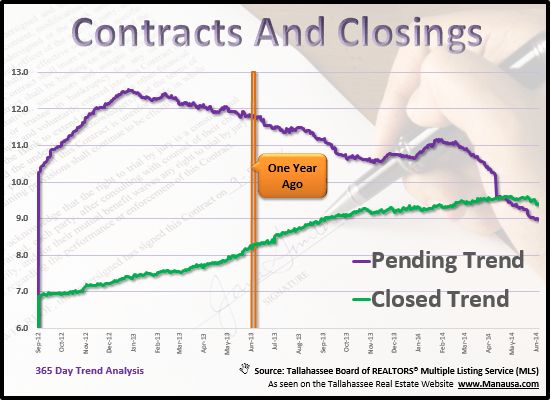 So here we are four months later and the trend of declining homebuyer activity is firmly rooted in the Tallahassee real estate market, and I'm not entirely sure what is going on. You will see it in this month's infographic (available for download), and you'll see it in the growing supply of homes for sale in Tallahassee. This trend is so disturbing that I have included an opinion poll to see if some of our readers can tell us what they think is causing the rapid decline in new real estate contracts. The following real estate graph shows two important trends, and they are moving in a very odd and disturbing manner. The purple line (new contracts) shows a general decline in buyer activity that started at the beginning of 2013, while the green line (closed home sales) shows a steady incline over that same time period, except it appears to be changing as of two weeks ago. What this means is that for the past 18 months, fewer buyers were writing contracts, yet more buyers were closing on home purchases. Those should be conflicting trends. Were it not for the downtown in closings in May, we would be doubly purplexed. How is it possible for "more closings" to come from "fewer contracts?" The latter appears to be related to the decline of short sales in Tallahassee, which typically produce several contracts for the eventual closing. But the former is a mystery that we are going to put to our readers. Thank you for taking the poll, please check back from time to time to see what other readers have to say. 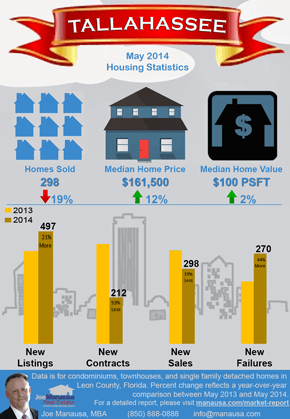 We have prepared our monthly infographic that provides a picture of the Tallahassee real estate market. Click on the image to the right to download a .pdf version that is large enough to enjoy. The number of homes sold in May was down 19% compared to May 2013, which is something that we have been warning sellers about when contracts first began to decline in February. Expect to see this declining trend continue, making it tougher for sellers to get their homes sold. The median price of a home sold in Tallahassee in May was 12% higher than last year, and the median home value was up 2% over that same time. The discrepancy between price and value can likely be attributed to falling interest rates which have armed buyers will more spending money. New listings and new failures rose, while new contracts and new closings declined in May. These are not minor spikes, we continue to see contracts down more than 60% since a year ago. If you are thinking about selling a home in Tallahassee, make sure you are armed with the very best marketing plan possible, or you will be leaving money on the table (or not selling at all). If you want to know more about selling a home in today's difficult market, just drop me a note and we can schedule a time to help you get the money you need and moved within your desired time frame.